A US national has been shot dead and another wounded in an ambush in Kuwait. The victims - both men - were civilian contractors working for the US military in Kuwait. The shooting happened as the men were inside their vehicle on Highway 85 near the Camp Doha military base north of Kuwait City. No one has claimed responsibility for the shooting. An unnamed official quoted by the AFP news agency said the authorities were looking for more than one assailant. More than 15,000 US soldiers are in Kuwait in preparation for a possible war with Iraq. There have been at least four attacks on US personnel in the oil-rich Gulf emirate in recent months, in which one soldier died and three others were wounded. The BBC's Caroline Wyatt says the attack is extremely worrying for the Kuwaiti Government, which has quietly allowed the American build-up in the Kuwaiti desert. While most Kuwaitis have welcomed the US troops, a small minority in the country is deeply unhappy with the American presence, our correspondent says. But US soldiers training in urban warfare close to the border with Iraq say the incident will not affect their morale or their operations. 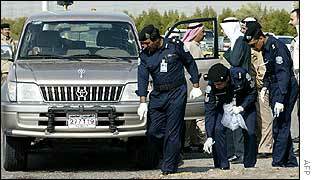 Kuwait Parliament Speaker Jassem al-Kharafi said he did not believe an organised group was behind the attack. "These are individual acts which do not reflect the feelings of Kuwaiti society," he said. "These acts are the work of ignorant, destructive people." Foreign Minister Sheikh Sabah Al-Ahmad Al-Jaber Al-Sabah echoed the sentiment, saying he did not believe it would affect his country's good relations with the Americans. Condemning the "terrorist incident", US Ambassador to Kuwait Richard Jones said he had "full confidence that the Kuwaiti authorities will pursue their investigation... vigorously and professionally". The attack happened at 0914 (0614 GMT). It is believed the gunman was hiding in bushes at the side of the road near traffic lights at an intersection. The four-wheel-drive Toyota had its windows shot out and was riddled with bullets. 21 Jan: Civilian US contractor killed, one wounded, in ambush on car near Camp Doha. 21 Nov: Two US soldiers wounded by policeman near Camp Doha. 14 Oct: Troops fired on from civilian vehicle near Kuwait City. No one hurt. 9 Oct: Civilian vehicle threatening US troops near Camp Doha is fired on. No one hurt. 8 Oct: US soldier killed, another wounded, by gunmen on Kuwaiti island. Attackers killed. Cartridge cases from rounds fired from a Kalashnikov rifle were found at the scene, police said. The car was later taken away by investigators. The passenger in the Toyota was killed and the injured driver was taken to the military hospital in Kuwait with gunshot wounds to his shoulder and thigh. His condition is said to be stable. Last November, two US soldiers were shot and wounded when a Kuwaiti policeman opened fire on them on a highway south of Kuwait City. The previous month, two Kuwaitis attacked US Marines training on an island, killing one. The BBC's Stephen Cviic, in Kuwait, says there may have been other violent incidents which neither the Americans nor the Kuwaitis are keen to publicise. Kuwaiti officials said recently that they had arrested a Kuwaiti soldier suspected of being an Iraqi spy. Newspapers in the emirate said the man had been planning attacks on American targets in Kuwait, including an attempt to poison troops. "It is the sixth incident of it's kind here"
"One man died at the scene"